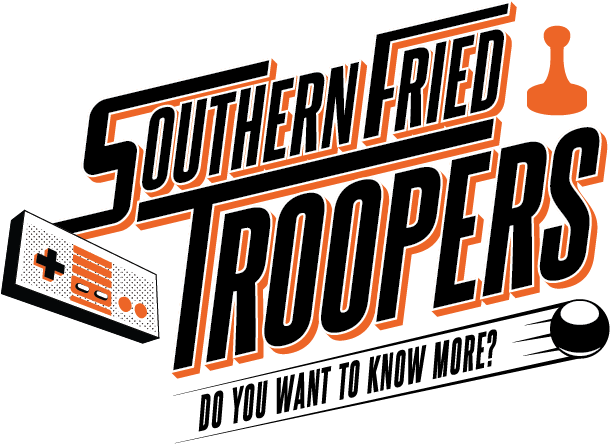 Thanks for your interest in becoming part of the 2019 Southern-Fried Troopers (The volunteers who make SFGE run at full throttle all weekend). We want your weekend to be rewarding while you volunteer, and in order to best help that please read the rules below. Then be sure to complete the form if volunteering is something that interests you. We promise it’s a lot of fun! Have you volunteered with SFGE previously. Please check all previous years. Volunteers must be over the age of 16. Any staff volunteers under the age of 18 will need to fill out a Permission Form, to be signed by a parent or guardian. Volunteers are expected to perform their duties accurately and completely, and may be asked to perform extra duties for the convention in addition to their original sign-up times. Volunteers must be able to devote time and effort to the event before, during and after. Volunteers are required to be at assigned location during their assigned hours, failure to do so may mean removal of your free entry to the show. Volunteers are required to provide accurate information to SFGE, with the understanding that no information will be available to anyone outside of the convention. Volunteers are required to abide by the same rules as attendees. Volunteers are restricted from any activity that will take their attention away from the assigned duty that they are responsible for while working. This includes, but is not limited to, working for a vendor or artist, playing games while watching a room, participating in a contest while staffing said contest, etc. After their scheduled hours, volunteers are welcome to enjoy the events of the convention, but SFGE duties take precedence over other activities. No volunteer should give their badge to any attendee for any reason. If a volunteer gives his/her badge to an attendee, he/she is subject to expulsion and permanent ban from working future SFGE events. As a representative of SFGE, volunteers are asked to abide by certain etiquette standards before, during, and after the convention. Volunteers are reminded that most equipment at SFGE is donated, therefore no one who is not on volunteer staff or owner of the equipment is allowed to touch equipment or games without permission at ANY time for ANY reason. Should a volunteer fail to abide by the rules outlined in this document, or behave untoward while representing the convention (whether it be at the event, on a public forum, or otherwise), a warning, reassignment, or expulsion may be enacted. The severity of the offense will dictate the severity of the discipline. Try to show up at least a little early for your shift, for two reasons: it allows time if you have to be briefed, and it’s a lot less nerve-wracking to the person who’s waiting for you to show up. Keep in mind that you’ll be in the same anxious shoes near the end of your shift! If a machine/game system is having trouble and a simple reboot does not correct the issue, place a Out of Order sign on the equipment and report the machine to the repair room. ALWAYS be courteous, friendly and cooperative. It’s OK to show a guest how to play a game but not OK to play the game for 20 minutes with the guest. If you cannot get in touch with your Southern-Fried Troopers CAPTAIN just drop by registration/volunteers and see if someone can help. Volunteers who work more than 7 hours over the weekend are entitled to one free weekend admission to SFGE. Volunteers who work more than 3 hours receive a day pass. you cannot receive both. 2019 Volunteers who successfully served at SFGE2018 will receive our cool and exclusive Southern-Fried Troopers shirt. Volunteer meetings, volunteer events, and communications between SFGE and general volunteer staff contain information from SFGE which may be confidential and privileged. Please refrain from any disclosure, copying, distribution or use of this information and note that such actions are prohibited until an official statement is released by the convention. This includes guest announcements, events, and convention policies and practices. Gameroom Load in and Load out – One of the most integral parts of our expo is the gameroom, and we need tons of help moving and staging full-sized pinball and arcade games. Gameroom loaders will assist game-bringers with the use of hand trucks to remove games from vehicles and transport them to the show floor and assist with setup as needed. Volunteers need to be able to lift 50lbs or more. By completing your volunteer hours before and/or after the expo you get to enjoy more hours at the convention. Tech Ops/AV – Our Tech Ops team is used to not only set up our A/V equipment for the show but to ensure events run smoothly. This small group handles all of the equipment for panel rooms and some music equipment. Previous experience running a mixer/sound board would be helpful. Tabletop Area Volunteers – Our tabletop crew will assist with game check-in and check-out. This team also works to ensure demo tables are ready for groups to use. Are you a night owl? Board gaming is going 24-hours a day, so if you want to enjoy the expo during the day and have a low-key volunteering shift at night, this is for you. Both day and evening time slots are available. Game Room Monitor – Add credits as needed, place out of order signs, work with techs on down machines, assist with removal of out of order machines, tidy up, help with traffic flow, and more. Gameroom Repair Techs – This crew works to keep the play floor operational by doing minor repairs to pinball and video machines on the floor. They can also pull a machine from the floor or contact an owner should the need arise. Tournaments (non-PAPA) – We are always running some kind of retro, pinball, modern, tabletop tournament and we need people to help. Assistance can involve keeping track of scores, cycling games, and awarding prizes. You don’t have to know anything about the game for the tournament but it can help if you do. Security/Door Monitoring – We can always use an extra set of eyes at the doors and on the floor. Many of these positions are helping helping attendees and checking badges. Film Fest – We have lots of movies to show and monitors in this room will need to monitor traffic/seating, assist if a panel follows a movie, possibly start movies and report any tech issues to Tech Ops. Put me anywhere! – Want to help, but don’t have a general preference. Allowing us to put you anywhere helps us fill gaps in the volunteer schedule.